Marantz Professional’s Voice Rover is a battery-powered PA system that delivers true, professional-grade sound-reinforcement to an outdoor event or large interior space even when there’s no access to AC power. Voice Rover can operate plugged into a wall outlet, or it can go for up to 12 hours off its built-in rechargeable battery. The powerful internal Class D amplifier drives a 10-inch two-way speaker system in a compact, lightweight enclosure. 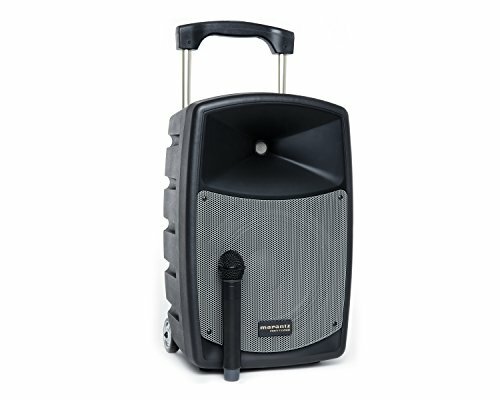 Its retractable handle and built-in transport wheels make it easy to move between setups, so Voice Rover goes wherever you need it for clear, punchy sound: outdoor weddings and business meetings, backyard barbecues, award/graduation ceremonies, singers/small musical ensembles, and more. If you have any questions about this product by Marantz Professional, contact us by completing and submitting the form below. If you are looking for a specif part number, please include it with your message.